A millennial mom and entrepreneur had this dream of creating a beauty line that will catch the fancy of women of all ages and cultures. “Hello Gorgeous” was an offshoot of her love for everything that is beautiful and the need to rebound from a crisis that hit her family. Marrying these two was not at all difficult for this professional hair and make-up artist who had once dabbled in the glitzy and glamorous life of prepping up celebrities. “What really pushed me to go into this business was my mom. When my brother died of brain cancer, we were totally broke. My mom let go of several of her spa branches to pay for the bills. She felt that after a very tiring and emotional episode, we need to create a new business that will not only provide us livelihood but will help uplift our spirits and create a beautiful vibe for customers,” said Hello Gorgeous co-founder and chief executive Mawy Sapuay. With only P30,000 in initial capital, Sapuay has created 70 products with 160 SKUs in a span of three years starting with spa essentials that expanded to a full-fledged beauty line. Hello Gorgeous is currently working on a special collaboration with Sanrio of Hong Kong to carry one of the popular characters in a specially-designed packaging. “We are truly excited that out of so many cosmetic brands, we were the preferred brand of Sanrio. It is really an honor for us to be recognized alongside Happy Skin, Sunnies Face and other make-up brands known worldwide,” Sapuay said. 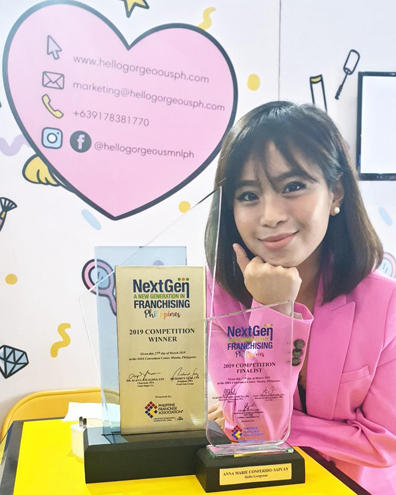 Sapuay is bound to go to the US to compete for the international franchising competition after bagging the top prize for her pitch at the NextGen, A New Generation in Franchising competition during the 27th Asia Franchise Philippines 2019 which was hosted by the Philippine Franchise Association. “To be honest, I came to win. I told my mom that I am going to win. I did my homework. I really prepared for this. And on top of that, I need this for my plan,” she said. Currently, she’s training hard with mentors from PFA and Francorp, in preparation for her US competition in the second quarter of the year. Her three years of hard work in rebranding her beauty and skin care line did wonders for the company as it earned about P12 million in 2018, up from P2 million in the first and second years. “As we drafted our plans, we saw the potential of us earning P35 million this year, our third year as ‘Hello Gorgeous’ brand,” said Sapuay. She said the sales from five franchisees and from five family-owned stores in the malls and online revenues from resellers will create the opportunity to realize the 2019 target. Sapuay’s line was previously marketed under the Skinline Essentials brand three years ago, but she thought it would be more fun and catchy to rebrand Skinline as Hello Gorgeous in 2017 in line with the millennial vibe. Made from natural and organic ingredients, Hello Gorgeous uses natural colorants and scents as well as essential oils for their cosmetics, skincare products like moisturizers, soaps, lotions and shampoos. “You might notice that some of our products have a short shelf life and some easily catch molds. This is because we use natural ingredients. But as much as we want to be 100-percent natural, there is no cosmetic product that is purely natural and organic. Our products have as much as 30 percent synthetic ingredients,” Sapuay said. The brand uses locally-sourced ingredients like virgin coconut oil, active carbon and clay for skincare products and imported substances like minerals from Jeju Island, shea and cocoa butter and sea salt from the Dead Sea, to name a few. In keeping with the rapid strides on cosmetics trends, Sapuay and her team are a constant presence in international conferences and conventions on beauty and skincare. Travels and her love for make-up influenced her to pursue a degree in hair styling and make-up after deciding to ditch her academic pursuits of a degree in pharmacy and biochemistry. “It was tough for me pursuing my studies since I got married that time. But my two years of Pharmacy and two years of Biochemistry helped me understand the basics in formulating our products. But we also have a chemist who checks and balances our products,” she said. The brand employs beauty ambassadors who lead the company-owned stores and 10 people who are responsible for manufacturing the products in a 300-square-meter production site in Bulacan. As a brand, Hello Gorgeous is not a hard sell. With the catchy logo and fun packaging design, the product was easily accepted in the local market and piqued the interest of customers from foreign markets. A franchise package is worth P750,000 complete with a kiosk inside the mall, all permits included and a starting product inventory worth P100,000. “For us, franchisees come first. Everything is worked out already. All the franchisees need to do is operate. Return on investment is about 1.2 years. We continue to push their sales by introducing loyalty card, exclusive in-store products and and special promotions,” Sapuay said. The brand continues to engage women on cosmetics and how to make money out of it. Hello Gorgeous products were proven to help prevent and heal acne for those with sensitive skin. In the near term, the brand is planning to have a mini beauty hub inside the store for express facial and allow customers a first-hand experience to feel the brand. The company’s five-year plan is to have 54 stores including franchises in 15 key cities across the country. It is also looking at penetrating the US, with at least two stores in New York and California. Starting this year, the brand will stop using plastic packaging and replace them with paper and cardboard-based packaging. Sapuay said environmental sustainability is an important pillar of the company in the same manner that giving livelihood to women is. She said that thousands of useless plastic are thrown away daily and somehow find their way to bodies of water. “Because of this, we launched a buyback campaign where customers are encouraged to sell back to us the packaging of their purchases for P15 each. We’re actually buying back the packaging at a loss. But never mind that, we want to establish sustainability in packaging,” she said. Sapuay said the number of resellers is growing and all of them are women, some are stay-at-home or full-time wife and mothers, while others are students and single women with entrepreneurial skills. Hello Gorgeous resellers reached 35 as of end-2018, and more are expected to join the brand as it gains popularity and create a name in the beauty and cosmetics space. The brand successfully engaged some resellers in Singapore.